The story of a team of 12 Green Berets who faced down the Taliban post-9/11 while riding into combat on horses. They could have called this movie "War Horse," but that title was already taken. "12 Strong" is a historical military drama based on the now declassified true story of the horse soldiers of Afghanistan. The film is directed by Nicolai Fuglsig, who only has one other film credit to his name. It is written by Ted Tally and Peter Craig and is based on the book "Horse Soldiers" by Doug Stanton. The film stars Chris Hemsworth as Captain Mitch Nelson, the leader of a team of Green Berets on a mission in Afghanistan just a few days after 9/11. Their task is to meet a local warlord named General Dostum, played by Navid Negahban, and help him and his army run an attack on the Taliban in the area. Also in the film are Michael Shannon, Michael Peña, Trevante Rhodes, Geoff Stults, and Thad Luckinbill, who play some of the members of Captain Nelson's team. Captain Nelson is inexperienced in combat, but that doesn't taint his confidence in the slightest. He makes lofty promises about what his team can deliver. The terrain they are trying to deal with in the region is perilous, and working with General Dostum is much more difficult than he expected. 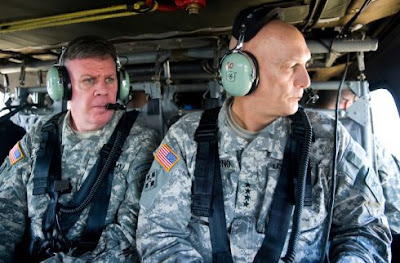 In order to fulfill his goal, he and his team will have to do what no United States military team has had to do in decades: ride into battle on horseback. The story of a group of soldiers riding into battle on horseback is pretty harrowing. Charging down truck-mounted high caliber machine guns, tanks, and rockets on mounted cavalry is the stuff of legends. "12 Strong" does show these moments, but many of the combat operations also involve phoning in coordinates on a radio and waiting for planes to drop bombs on the enemy. That probably helped the situation quite a bit. This movie plays out exactly as one might expect. It is a fairly standard, well-choreographed war drama based on a true story. There is a lot, and we mean a lot, of gunfire and explosions, which may be enough to satisfy most fans of combat films. The story itself doesn't have a lot of meat and potatoes. The characters are fairly thin, and this goes double for the women in the film, who only exist to say inspirational phrases and give the men a reason to come home alive. Unfortunately, because the familial units are so tossed aside, we never feel a strong connection to any of the characters. The subplots involving each soldier's family could have been omitted, and it wouldn't have made any difference. This isn't the biggest problem with the film. It's a little too long and a little too repetitive. Most of the actors are playing to type. Need a character who can bring some comedic relief? Cast Michael Peña! Need a hulking leader? Chris Hemsworth is your guy! Look, we enjoy Hemsworth as Thor, but he really hasn't had much success outside of his role as the God of Thunder. He loses his put-on American accent frequently. Michael Shannon gives the best performance in the film by far. Also, we love that Navid Negahban's General Dostum gets to tell Michael Shannon he has "the eyes of a killer." We've been saying that for years! 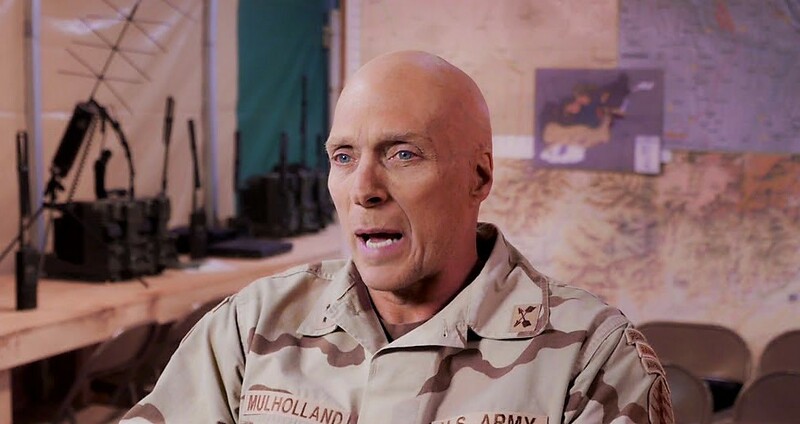 Also, though it seems minor, the biggest problem we had with "12 Strong" is how distractingly bad William Fitchner's bald cap looks. On a huge movie theater screen, you can totally see the seams. The only way we can possibly fathom the people behind the screens making this awful, appalling choice is that they asked for a photo of John F. Mulholland Jr. and were sent this picture. Looking at this picture, you might say, "well, this actually looks pretty close, what are you guys bitching about?" Just one problem: Mulholland is the man on the left, not the bald man on the right. C'mon, you know that's what happened. 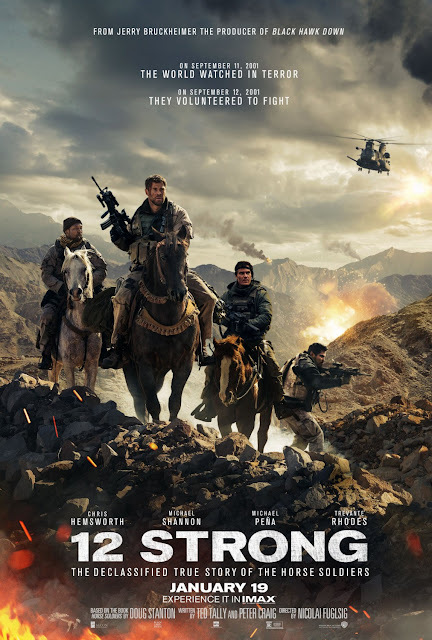 In the end, "12 Strong" is an average 'glory of war' picture that might be a little bit too long and a little too undeveloped, but may be worth checking out if you're a fan of the genre.